Given the very positive experience with this connection type, it has been incorporated into all the following implant ranges with an internal connection from BEGO Implant Systems and plays a key role in the international success of BEGO Semados® implants. If the cone angles in the implant-abutment connection are small, the implant body spreads when subjected to masticatory loading. Similar to splitting wood with an axe, a wedge effect develops. 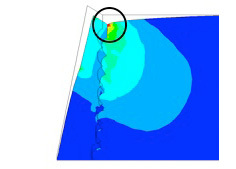 This wedge effect results in additional loading in the bone (Fig. 2a). 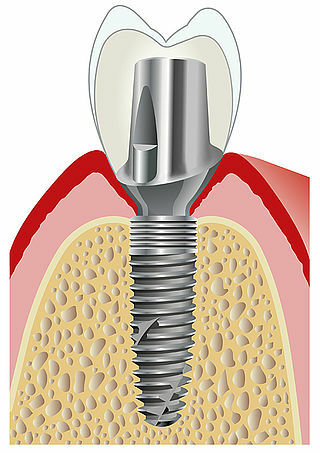 Implant-abutment connections with larger cone angles (e.g., 45°) avoid this wedge effect and bone loading is reduced (Fig. 2b) . To ensure no bacteria enter the implant-abutment connection, it is essential to avoid development of a micro-gap between the implant and abutment when subjected to masticatory loading. 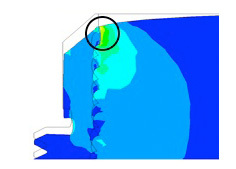 Trials  and finite element calculations  have shown that no micro-gap forms when a 45° cone is used when subjected to physiological masticatory loading. The RS/RSX-Line implants have a 0.25 mm platform switch. The platform switch reduces the loading peaks in the bone along the bone margin. The term "platform switch" refers to the difference in diameter between the abutment where it enters the implant and the external diameter of the implant . If the bone is exactly at the point of the diameter difference, this creates a biomechanically advantageous situation for the bone. The diameter change transfers the force deeper into the bone, which decreases the bone load along the bone margin . However, the biomechanical effect of platform switching is only effective if the bone is exactly at the level of the platform switching. If, during insertion, a gap of just 0.5 mm appears between the bone and the level of the platform switching or if the bone recedes by the same amount, the biomechanical effect will disappear. To relieve the loading on the bone in cases where the bone is somewhat deeper, the RS/RSX-Line implants also feature bionic microgrooves. Flach, M. / Streckbein, P. (2009): Knochenfreundlicher Kompromiss, Dental Magazin, 27:48-53. Zipprich, H. / Weigl, P. / Lange, B. / Lauer, H.-C. (2007): Erfassung, Ursachen und Folgen von Mikrobewegungen am Implantat-Abutment-Interface. Implantologie, 15:31-46. Streckbein, P. / Streckbein, R. G. / Wilbrand, J. F. / Malik, C. Y. / Schaaf, H. / Howaldt, H. P. / Flach, M. (2012): Non-linear 3D evaluation of different oral implant-abutment connections, J Dent Res, 91:1184-1189. Tabata, L. F. / Rocha, E. P. / Barao, V. A. / Assuncao, W. G. (2011): Platform Switching: Biomechanical Evaluation Using Three-Dimensional Finite Element Analysis, The International Journal of Oral & Maxillofacial Implants, 26:482-492.